... and got a bit carried away! These are made by sponging a strip of Whisper White card stock with ink using sponge daubers. I used Bashful Blue for the sky and Old Olive and Soft Suede for the ground. The foliage images are from various sets and are stamped in Old Olive and Always Artichoke over the top of the sponged background. The flowers are punched from bright card stock with the Boho Blossoms punch and attached to the stamped strip with coordinating brads. The corners at the top of the strip were rounded and then it was matted onto coloured card stock. I stuck a matching 1/2" circle to the top, punched a hole through all the layers and threaded it with 1/4" grosgrain ribbon. And there we have it - really quick and such fun to make! Here are a couple using the wider grosgrain ribbon attached with staples. Doesn't that All a Flutter butterfly look gorgeous in blue? It's so easy to add soft colour with your ink pads and a blender pen. It seemed a waste not to use up these scraps of the beautiful Cottage Wall designer paper! I stamped the paper with leaves from the Pocket Silhouettes stamp set, matted it onto Rich Razzleberry card stock and attached flowers punched with the Boho Blossoms and 5 petal punches using silver brads. So now reading, which is already a real luxury for me, will become an even greater pleasure! And why not make some more to add a personal touch to a gift of a book or a book token? Believe me, it's quite hard to stop once you get going! With the holidays fast approaching is easy to lose yourself in the busy end-of-term rush. But don't forget to schedule in some 'me' time - a stamping party with your girlfriends may be just the breather you need! Why not email me to see if the date you want is free. They are so lovely ... 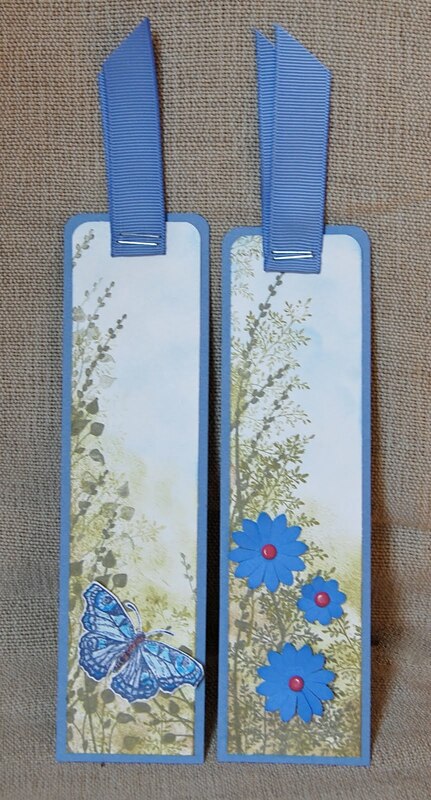 I have been thinking about it.. but its taking me forever to make a bookmark..
Love these Vicky so pretty and you are spot on with the all a flutter butterfly the colour is gorgeous. Beautiful bookmarks Vicky and what a good idea. I must admit I use anything thats handy, usually old lottery tickets lol. Great for fundraisers too! These are soooo beautiful, I just love them. These are all truly stunning. I love the use of the Pocket Silhouettes set to create the meadows. I make myself and my hubby bookmarks all the time. I like to created themed ones to go with the type of books we're reading. Gorgeous bookmarks. I like them all. I love your bookmarks and you've inspired me to try making some. Thanks for sharing! 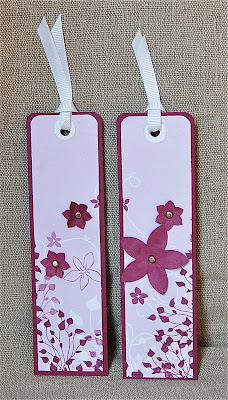 Saw these on Pinterest and had to stop looking and come to your page to see how you made these lovely bookmarks. They are beautiful and I'm going to make some myself. Thanks for sharing.